– How do you pay for DMA trips? In the absence of a Travel Sugar Daddy, and myself being a poor Jewish girl from Detroit, well, I’ve used savings thus far. As I don’t want to use it all up, I’ve rented out my house, sold my car, furniture and clothes to help finance this. It’s my passion project. But, if you’ve got some extra frequent flyer miles, a travel voucher, or a free hotel night you can’t use, I take donations! Just click here to contact me. You mean I can’t crash at your place? Yeh, I like my privacy too, which is why I use a combination of places. While on DMA trips I stay at a variety of places. Remember, DMA is all about not planning. I’ve stayed in hotels, B&B’s, AirBnB, hostels (private room please), guest houses, apartments, nudist RV resorts (remember that? ), and a yurt. You may recall I’ve even stayed at the houses of people I’ve met while traveling. In between DMA trips, I hope also housesitting around the world, spending time with people’s dogs, cats and other furry or scaley friend. – How did DMA begin? Believe it or not, it all started with a Twitter chat. After twenty-years in various aspects of the travel industry, I’d left my job at Disney Cruise Line nearly a year before (that’s a whole other story) and was had decided to take some time to figure out what my next passion would be. I was participating in a Twitter travel chat where the host asks numbered questions using hashtags and participants answer using the same hashtag. One question asked was, “If you had a TV show, what would it be about and what would it be called?” without thinking, I answered, “Mine is about unplanned travel and it’s called ‘Drop Me Anywhere!’” The answer just sort of fell out of my fingers and onto the keyboard. It came as a total surprise to me. The immediate, positive response was overwhelming. Still, while I’ve done a decent amount of on-camera media, writing is my comfort zone. I’d been writing for various websites and my own blogs (My Own Adventure and Rebel-With-A-Cause) for a few years and had developed a style and confidence that my writing wouldn’t embarrass my high-school English teacher. And I really had no desire to be self-employed once again (I’ve been there and done that). After a couple of weeks of the idea still nagging at me, I wrote to a fairly well-respected travel writer I’d had previous contact with and asked, “Is this something?” He loved the idea and gave me advice on the best forum in which to do it. With a lack of anything immediate for which I felt a passion for, well, I took a leap of faith. – How many countries have you been to? – Do you have a list of places you’ve been so I can be sure to send you someplace new? While I completely understand the question, and I do have a list, I keep it private. You see, when I go to a place with DMA, it’s unplanned, so it’s usually a much different experience than when I was there previously. The trip to Mexico with the “Ancient Civilizations” vote is a good example (read “The Good, The Bad and The Thank-you’s – Mexico” to understand why going someplace I’ve been before can be a whole different experience. Also, I may have been someplace ten-or-more years ago, which could mean visiting a very different place than it used to be. – Which is your favorite place? Really? Which is your favorite child? Don’t ask me to name just one. Ok, today my top three are Budapest, Gili Air (Indonesia) and the U.S . . .and throw in Newfoundland. . . and Botswana . . . oh, and Ireland. . .and, oh crap, I can’t do this. – How long are you normally home before you get the urge to travel again? It used to be about three weeks. Now, I miss home every three weeks or so, but I haven’t been home since December 13, 2014. – How do I help the organizations you volunteer with on DMA? Glad you asked; within a couple of weeks of volunteering with the projects or organizations you can find them profiled on www.Rebel-With-A-Cause.org. I tell you who they are, who they help, and how you can get involved. You’ll find links to their websites and social media. I also link to them under the DMA menu tab “Organizations We Support.” I try to volunteer with a variety of organizations so you can find one that supports your passion, although my volunteer efforts are very location dependent. 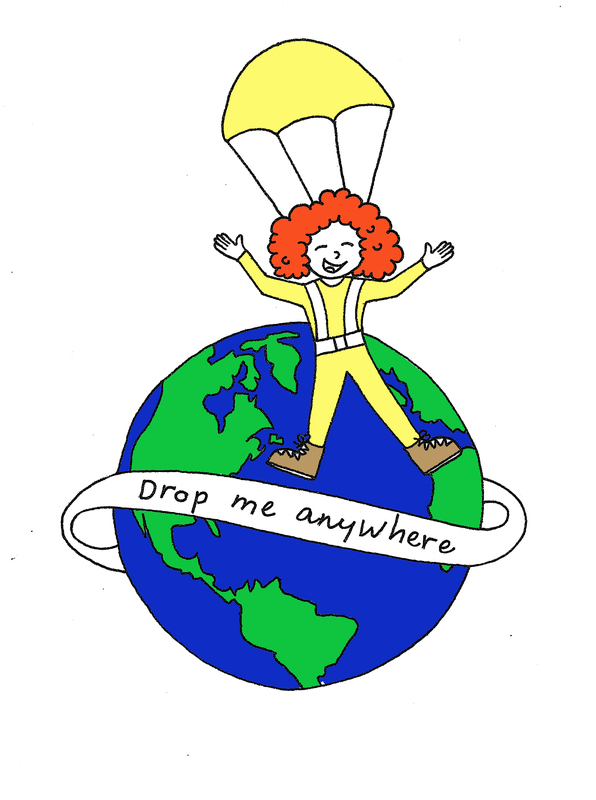 – Where can I find Drop Me Anywhere on social media? – Do you accept sponsored posts or paid advertising? Heck yeh. I accept advertising for a monthly fee. Feel free to contact me for analytics and rates. I also accept sponsorships. Please understand that acceptance of any of these in no way guarantees a positive review, your great service to me as a customer is what will guarantee that. – Do you write elsewhere? Yup, I’m all over the place. I write for examiner.com for world travel and formerly for Arizona related tourism stories. You can find me writing regularly for The Yucatan Times as well as for corporate clients for their websites, blogs, client communications and brochures. Finally, I write for two other blogs I own – www.Rebel-With-A-Cause.org which is the philanthropic sister of DMA as well as My Own Adventure which is my, often humorous, sometimes touching and generally quirky take on the world around me. Got more questions? Feel free to click the “Contact Me” link on the menu and as away? Or as in the comment section here and I’ll answer as truthfully as I can without getting arrested.